Premier Notley made several noteworthy comments during her recent campaign-style speech to the Edmonton Chamber of Commerce, from ruling out a sales tax to rehashing spending scandals of past governments. But what really stood out was her claim that her government is on a “clear path” to budget balance by 2023. If that path exists, we haven’t seen it. Clearly, the premier inherited a challenging fiscal situation. With a sharp decline in oil prices and decade of program spending increases running (on average) nearly double the combined rate of inflation plus population growth, spending was way out of line with revenue. The province had already run nearly uninterrupted deficits since 2008/09. And while the Prentice government reduced program spending and balanced the budget, the Notley government began increasing spending almost immediately after taking government. As a result, the government returned to deficits and is unlikely to balance the budget in the near future without some bigtime luck from the oil market. In short, the “clear path” to budget balance is to hope and pray for another spike in resource revenue. And deficits matter. They aren’t simply numbers on a ledger sheet. When a province spends more than it takes in, and consequently racks up debt, taxpayers pay the interest. And companies looking to invest may look elsewhere if they believe red ink today means higher taxes tomorrow. All this hurts workers by limiting opportunity and lightening the wallet. Premier Notley should accept the reality of Alberta’s fiscal situation rather than wrongly suggest that much of the hard work has been done and a solid plan is in place. Consider this. In the 2008/09 fiscal year, the province had $35 billion in net financial assets. In other words, the financial assets owned by the province (such as the Heritage Fund) exceeded the province’s debts. By 2022/23, the government projects our net debt will reach $56 billion—and that’s assuming that this vague path to balance materializes. A $91 billion decrease in net assets in less than 15 years is alarming, to say the least. It will likely mean that we leapfrog British Columbia and Saskatchewan in net debt per person—a remarkable change of fortunes. While that doesn’t get us to Ontario levels of debt, it means that our debt-interest costs will rise to more than $500 annually per person by 2019/20. 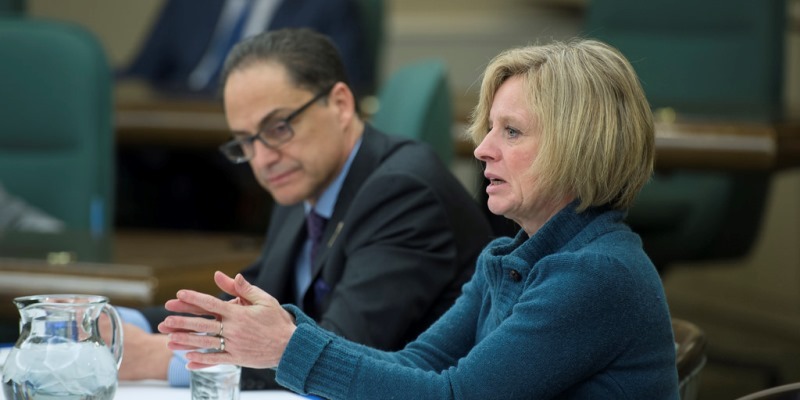 In short, the province is piling up debt at a historically rapid pace and rather than taking active steps to staunch the bleeding, the Notley government is passively waiting for an increase in resource revenues to do the heavy lifting. So what would it take to get on track for a balanced budget? It would likely require program spending to be roughly frozen for several years—a decision Premier Notley says would require “reckless cuts.” While she correctly notes that the population isn’t frozen, so a nominal spending freeze would effectively require less per person spending. But would that require reckless spending cuts? That depends on whether one believes that spending 20 per cent more per person than B.C. is necessary. Given that B.C. has comparable public services, has mostly run balanced budgets lately, and manages to keep the lights on, this doesn’t seem especially reckless. After more than a decade of rapid program spending increases, it’s time for some right-sizing in the public sector. Rather than re-litigating the missteps of past governments or guessing what the Opposition might do in government, Premier Notley and her team should present a credible realistic plan to balance the budget, without a swift return to lofty oil prices. Fear-mongering does nothing to change the province’s fiscal situation.